Kaiser Permanente selected Hollywood High School to be their first high school to partner up wth. 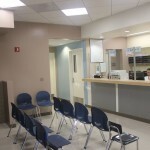 Kaiser recently built an on-campus clinic for the students and their parents. Kaiser partnered up with the Saban Health Clinic to help expand the clinic. Parents and students are eligible for free health services . Kaiser has also donated a large sum of money to Hollywood High and will continue over the next three years. Kaiser representative Ryan Woodson has helped remodel the school garden by funding for better soil and a new fence. “Our goal is to change the environment here at Hollywood High,”’ said Woodson. Ideas of remodeling the weight room with better equipment and exercise machines are being considered. A new weight room will be available for everyone to use the equipment to exercise. “It is great that we now have Kaiser to help us promote to every student to live healthier,” said Health Club President Dulce Gutierrez (SAS) 12th grader. Since the partnership with Kaiser began, many items that were sold in the student store or vending machines have been discontinued because they were not helping to promote a healthy living. “The reason why we did not sell chocolate bars this year was because it was unhealthy and what we are trying to do is to promote healthy habits,” said Principal Alejandra Sanchez.